They also took a plunge into the lake at PDG Lyn’s! 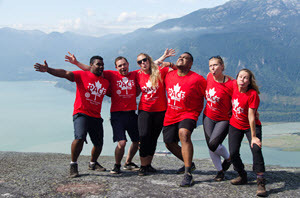 As it has always been tradition with this trip, they participated in two service activities while here - helping cook and served over 50 community members for the Burnaby Rotaract club’s Community Dinner, and helped mark drains at the Eagle Creek Watershed in North Burnaby. 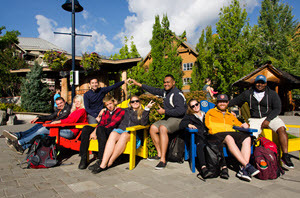 Their time together was filled with laughs, games, dancing in lines, the sharing of cultures and language, and the development of lifelong friendships - Christian from Germany even said everyone in the district can crash on his couch for Hamburg 2019! 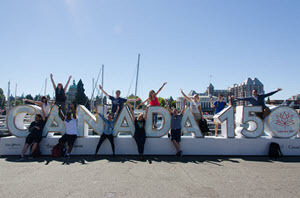 Additionally, we’d like to thank everyone who served on the planning committee and made this trip happen: Connor Trelawny, Eric Young, Majed El Saadi, Thomas Turniawan (Burnaby Rotaract), Emily MacLean (Vancouver Young Professionals Rotaract), and Katheline Cao and Maryam Bawa (Richmond Rotaract).